Reconstitute Porcini mushrooms in 1 cup warm water for about 30 minutes. Be sure to save the water for cooking the rice. 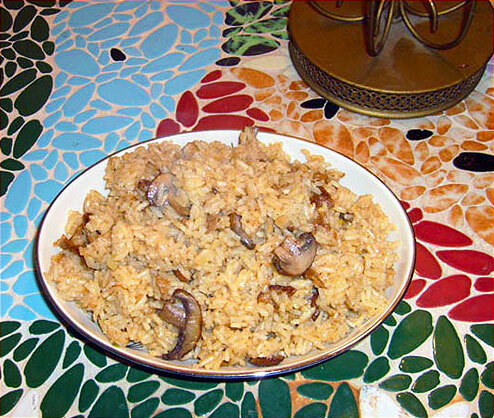 In a large pot, combine mushroom broth, vegetable broth, wine, rice, and a bit of salt to taste. Cover, bring to a boil, and simmer until the rice is done. While the rice is cooking, in a medium frying pan, heat truffle oil and olive oil. Add garlic, porcini, baby bella mushrooms, salt and fresh ground pepper, and saute’ until browned. Stir into the cooked rice, adding the parmesan and fresh ground pepper to taste. Lightly drizzle with a small amount of truffle oil and serve! Optional: Add a small handful of freshly chopped Italian parsley for color.